Gaza City – A fraught quiet has settled over the Gaza Strip after a night of Israeli air raids on the besieged coastal enclave following a rocket strike on a home in central Israel. An Egyptian-brokered ceasefire, announced around 19:00 GMT on Monday, was confirmed by a Hamas spokesperson, but the exchange of fire between armed groups in Gaza and the Israeli military continued until just before dawn on Tuesday, residents in the strip said. The latest flare-up took place after a long-range missile was fired from Gaza into the Israeli community of Mishmeret – 20km north of Tel Aviv – early Monday morning, wounding seven people. Throughout Monday night, Israeli warplanes targeted Hamas and Islamic Jihad positions with air raids. Hamas leader Ismail Haniya’s office was destroyed in the attack, as well as several residential buildings. 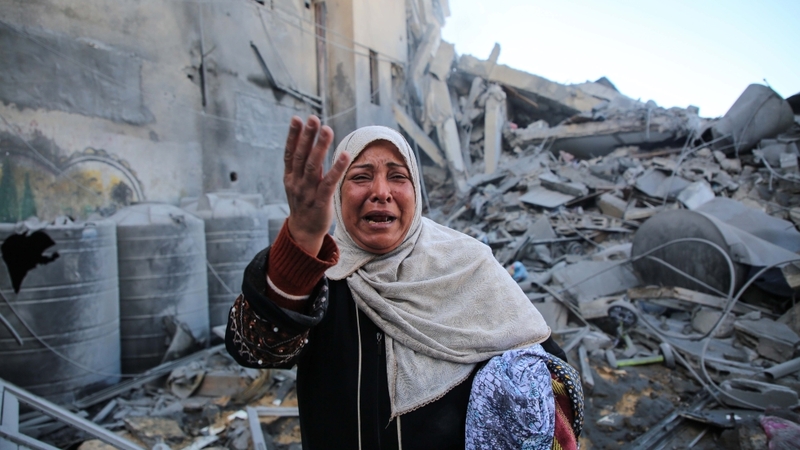 Sameh al-Ghazali, a Gaza resident, lost his home in Gaza City overnight. “We were shocked when we received a phone call from the Israeli army last night telling us to evacuate our home within seconds,” the father of one told Al Jazeera. The ceasefire was announced after Gaza’s armed groups launched a barrage of rockets towards Israel but, in a joint statement, the armed factions said they would stop firing rockets if Israel ceased its air raids. “We affirm our response to the Egyptian mediation of the ceasefire and declare our commitment to calm if the Israeli occupation does as well,” the statement said. Israeli Prime Minister Benjamin Netanyahu cut a visit to the United States short, where he was due to deliver a speech at the annual AIPAC conference in Washington, DC, vowing to “respond forcefully”. Netanyahu’s rivals have accused him of being too soft on Hamas, and thus the recent wave of escalation, according to Gaza-based political analyst Mohsen Abu Ramadan, can be attributed to the upcoming Israeli elections on April 9, in which the prime minister is seeking re-election. Whether the Palestinian factions would stick to the ceasefire was unclear. Abu Ramadan said there was a “possibility” more rockets would be launched, given the timing of events. On Saturday, Palestinians in Gaza will mark one year since the Great March of Return protests began. The weekly demonstrations, which kicked off in commemoration of Land Day, has witnessed Palestinians from all walks of life participating near the Israeli fence at five encampment points along the strip, demanding an end to Israel’s 12-year blockade. “There will likely be an escalation of the use of force by Israeli soldiers against the demonstrators,” he said of the upcoming protest where tens of thousands of people are expected to participate.